Using the latest in technology, imaging, materials and training we care for all of your eye-care needs. We have a friendly and welcoming environment where you will be treated not as a number but as our patient and neighbor. We are here to provide you with the highest level of care and we feel that it is vital for the patient to have access to all the pertinent information so that you can take a more active role in your visual, systemic health and treatment. We continue to be partnered with American Eyecare, who has been serving all your eyeglass needs for the past 35 years. Scott M. Krauchunas, O.D., Ph.D graduated from the New England College of Optometry in Boston , MA and has been in practice at InFocus Eyecare since 2005. Prior to his career in optometry, he earned a Ph.D. from Kent State University specializing in Physiological Psychology. Scott was an Associate Professor at St. Anselm College teaching general psychology, health psychology, physiological psychology, sensation and perception, and experimental design. At Infocus Eyecare, Dr. Krauchunas cares for all eyecare needs including comprehensive eye exams, contact lenses, glaucoma monitoring and treatment, diabetes monitoring, macular degeneration monitoring and treatment, pediatric eyecare, vision therapy, sports vision training and concussion management. Dr. Krauchunas is a founding member of the A-Team, a group of high performance vision specialists, who collectively have worked with LPGA, NASCAR, Miami Dolphins, IMG Academy, US Volleyball, MLS Soccer Referee. 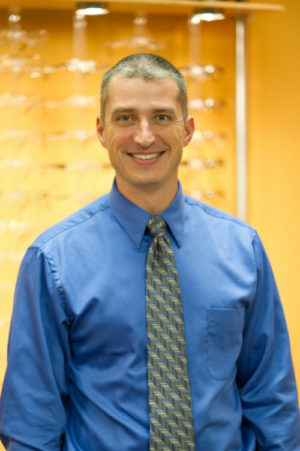 In 2015, Dr. Krauchunas was appointed to serve on the New Hampshire Board of Optometry by the Governor. In early 2016, Scott began working with a major league baseball team for sports vision assessments and baseline concussion protocols. His goal as a doctor is to provide his patients with the best care utilizing the latest in research and technology, and most importantly compassion. Angela Claffy, OD is a graduate of the Michigan College of Optometry. 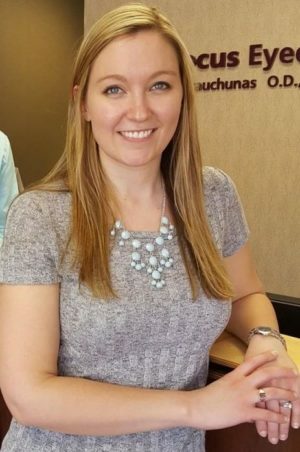 She is passionate about all aspects of optometry, with a special interest in pediatric and family eye care. Her professional training included internships at Walter Reed National Naval Hospital in Bethesda MD, followed by Wm. Jennings Bryan Dorn VA in Columbia SC, and at Laria Eye Care, a pediatric private practice in Miami, FL. When she’s not working, she enjoys spending time with her husband, Bill, and their two dogs.